Hey m'lovelies. How has everyone been? Thank you to anyone who donated to Cancer Research, We smashed our target as well as our time for the Race For Life, Well done if you participated. One thing that is essential for me during the summer is FAKE TAN. I have super fair skin and rarely tan. I thought I would share what I use to help get the perfect tanned look. The number one product I use is Fake tan. For the first time, I am using St Tropez Bronzing Mousse. I have always used St Moriz but this year I thought I would go all out. It is a bit pricey but for the quality it is extremely worth it. You will need to exfoliate your whole body before to help keep the tan on. I haven't photographed it but I use a normal tanning mitt to apply the tan. Make sure it is applied evenly so there are no streaks. I tend to have a few mirrors in my room so I can see right round my body. I really love St Tropez, it doesn't have a strong smell at all and it applies so easily. I have had the tan on for few days and although I have had baths and showers it is still visible. It is very long lastly which will be perfect whilst I am on holiday. I picked it up at Boots, but any Chemist/Drugstore will definitely have it. 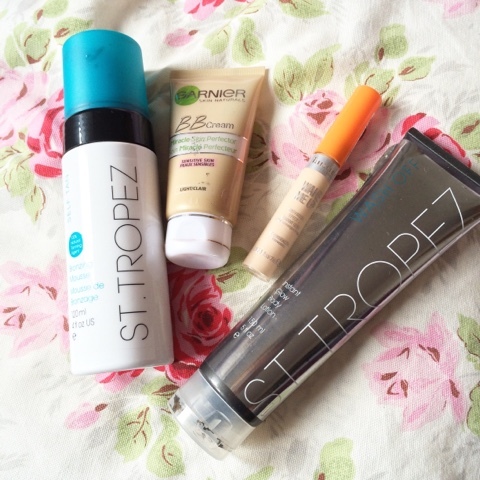 The St Tropez Instant Glow Body lotion is not a must have but I find it very helpful. If I do not want to spend time with the tanning mousse, have't got time or just want a quick bronzed up I reach for this. Is gives you a tan right away without having to wait. I have noticed because this is a lotion it comes off quite easily, this is not a major problem as I can just reapply. If I have already used my bronzing mousse, I normally will use this on areas that I feel get washed the most ie face or hands. Applying this to either, is really handy to brighten and top up my tan. What I love about St Tropez products is that they are infused with Vitamin E to protect and repair the skin. It is always nice to know that you are not damaging your skin. Getting the perfect tan is important but I thought I would share what I use in combination to get a perfect tanned face. Using fake tan on your face I find instantly makes it look much better and healthier. I veer away for a very heavy make-up look and use a BB cream. BB creams are very useful in the summer anyway. I use Garnier Miracle Skin Protector BB cream. I have it in the shade Light however it is quite dark. It is also rather thick so I will use a tiny about of Nars Sheer Glow too thin it down. It covers any blemishes without being heavy. It is the ideal shade,base and consistency for a great Tan. It is also has a good SPF which is makes is suitable in very hot days. The last product I use is Rimmel Wake Me Up concealer. I have mention before how much I love this stuff. The lightest shade is again too dark for everyday but using it with a tan is a winning combination. If you have ever used the concealer you will know it has shimmer through it which adds to the glow of your face. It has different moisturizing ingredients which will prevent your skin drying up in the sun. I would highly recommend this for those who have darker skin. for a perfect tan? Have you any tips?